LANDVIEWS.ORG is the online journal of LAND: Landscape, Art and Design. To become part of our growing network, please send us an email with your name, email address, and postal mailing address by clicking the link below. We'd love to hear from you about issues you’d like our online journal to discuss, or projects and events we can promote to our network members. My approach to creating ecological art relies on the interplay of restoration science and the creative process. As an artist interested in our cultural conditions, I wanted do more than witness and document the changes in our urban and rural landscapes. In a gallery, my sculptures suggest nature, not only through the materials used, but also in form, construction and gesture. But, as I make this work I have a hidden agenda. I use the gallery context to study the potential transformation of these sculptures into restorative components in the watershed. Once placed in the watershed, they take on a remedial quality, as they become integrated with the landscape. 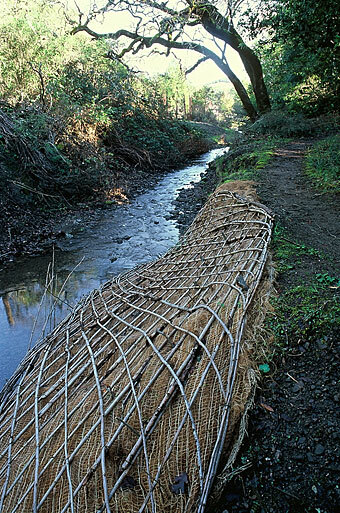 Recent installations demonstrate my endeavor to work with the watershed as an ecological installation. I want my sculptures to have a part in influencing the ecological balance of compromised environments. I am compelled by the idea of using sculpture in a way that will allow the damaged areas of the watershed to reestablish itself. As it has evolved, my art has become focused on strategically congregating sculptural components made from riparian materials back into the watershed system. They are intended to give advantage to the natural system, and after a period of time, as the restoration process is established, the artist’s presence shall no longer be felt. By installing my sculptures in the watershed, I can respond to mixed cultural relationships such as ranching, agriculture, tourism and increasing development, which impact the watershed in adverse ways. These watershed installations focus on a series of site specific activities that employ sculptural components from the watershed. My most recent body of work, “The Watershed: An Ecological Installation,” expresses my concern for eroding streams and creeks, and the resulting loss of habitat and historic spawning areas for Coho Salmon and Steelhead Trout. It led to a collaborative project with the United States National Park Service. It consists of large-scale sculptural forms that lend assistance in the restoration of watershed ecosystems. These sculptures function effectively as silt traps and erosion control devices. 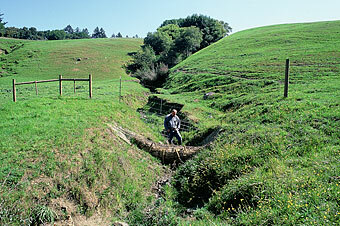 They are designed and sized to fit the curves of stream banks and gullies. In a gallery setting these shapes have inspired responses of “graceful, “feminine” and “organic”. However, I use these sculptures to create a landscape of meaning in the environment in which they are placed. At this point, the riparian material has only been juxtaposed within the watershed. The ultimate goal is to transform these sculptures into a sustainable component of the watershed, in order to reestablish vegetation and prevent further erosion. The sculptures are constructed of material taken directly from the watershedtrimmings from trees and brush. Once constructed and placed in damaged gullies and stream banks, the sculptures act as silt traps that collect the eroded soil and debris from pasturelands. The traps are filled with more riparian materialcuttings from nearby willowswhich help to filter the silt and allow cleaner flows downstream. (If left to flow into the stream during the winter rains, this silt would suffocate the eggs of spawning salmon and steelhead.) The sculptures eventually breakdown leaving the newly established willow to stabilize the stream bank, and begin the stream restoration process. The ability of the native willow re-root and establish itself with just the slightest bit of encouragement, sets the stage for the next phase of my work. I intend for the sculpture to disappear completely leaving a succession of native erosion-controlling growth to take hold. The intent is to make adjustments in the watershed so as to return a degree of equilibrium to the stream system. I work in areas that are both rural and urban, and the two extremes often exist adjacent to each other. Looking at the silted-up streambeds, one would never think at this point in the development of these populated areas, that fish could be seen. But increasingly each year, more and more salmon and steelhead are making their way up these streams and creeks to spawn. As an artist, I feel compelled to respond to the deterioration of our natural environment and conserve and preserve what is left. I view the watershed as a found object. I respectively impose my constructions on this found environment and its current conditions. Sharing my concerns, and bringing the community into the process of restoring compromised environments is a part of it. Most of my installations include an element of community education and participation. My intention is to help create a culture of sustainable habits by conducting public workshops both as part of the process of my art, and as a component of my installations. Daniel McCormick has worked as an artist and designer on interdisciplinary teams working on environmental restoration projects throughout the United States. He is currently working with the U.S. Department of the Interior, the California Conservation Corps and local schools as an Artist in the Parks to create several ongoing public art installations. He is a graduate of the College of Environmental Design, University of California Berkeley, and a working artist for over twenty years. This article was originally published in Landscape & Art, Summer 2003.